Orton have a complete range of motor driven torque controller cable reeling drums. This reels shown in this catalogue are direct reeling units where the cable compartment is mounted directly on the torque controller. For those applications where the length and weight of the cable is in excess of the design capability of the direct reeling units, we have the indirect driven torque controller reels. With these reels the torque controller unit powers the reel compartment through a suitably selected transmission system. 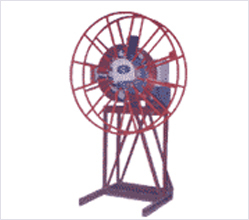 These types of cable reels are a reliable, low cost solution for reeling long lengths of cable. These drums are available for a complete range of cable lengths from 30 to 500 meters, for voltage upto 11000 V. These drums are easily installed, have an absolute minimum maintenance requirement and are virtually unaffected by extremes of temperature and environment. These types of cable reeling drums are available in 3 types viz monospiral, standard lay and random lay. Uses standard AC or DC motor as prime motor. This design reduces tensions in the reeled cable substantially as against other form of drive. Range of drive units to suit various sizes and length of cable to be reeled. Reduced overall size as compared with conventional motor. No chain drives, hence reduced maintenance. Selected reel will cover wide range of cable length & sizes. Combinations of core sizes and quantities can be readily accommodated, in standard size of housing.